Rotating circles is basically outside circles but with a twist. This move is not difficult to do but it can be difficult to understand and learn. The important things to know are the hand positions for the two exchanges. I'm going to try to show each step of this move as clearly as I can. I'm starting from a gripped position. I'm holding the hoop with hand one. My palm is facing up, the hoop is between my thumb and index finger. In this gripped position my arm is fully twisted. 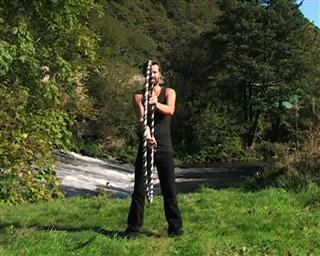 I start to release the twist, turning the hoop inwards. 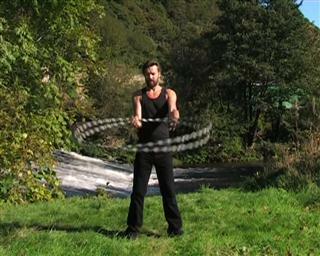 At the same time I start to move the hoop around my body in the same direction that I hoop. At this point my palm is still facing upward. I keep rotating the hoop. My thumb is now pointing upward. 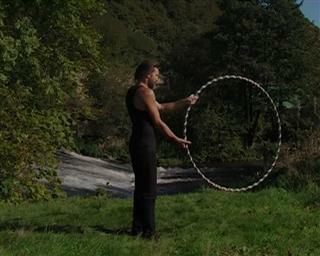 The hoop has rotated through 180 degrees. 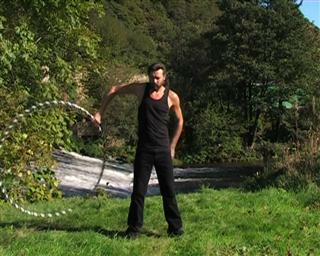 I keep rotating the hoop as I go around my body. 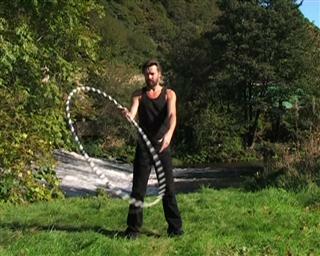 The hoop has now rotated through 360 degress, one full turn. 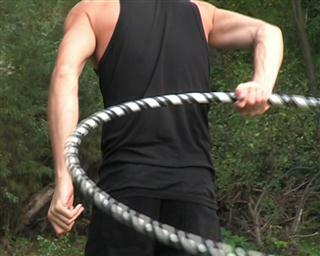 The hoop rotates through one more half turn by the time it gets to the back. It's now turned one and half times while being gripped by hand one. 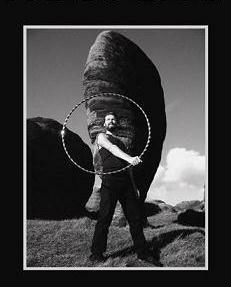 When the hoop reaches its final position my thumb is pointing upward. 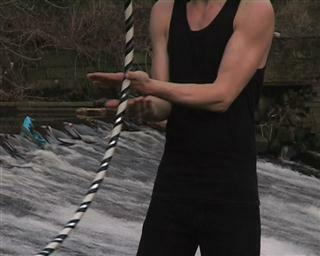 The hoop is vertical in the exchange and hand two also has the thumb pointing upward. Both arms are in the same position. rotating the hoop through one and a half turns as it circles the body. Arms are more outstrechted than in outside circles. When hand two returns to the front it's at full twist. 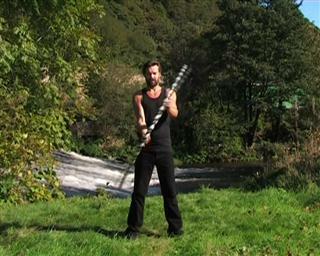 In the last part of the rotation allow the hoop to be gripped between thumb and index finger. Hand one comes in underneath hand two with palm facing upward. It's important to pay close attention to this exchange. Your hands are in the shape of a bird or butterfly. Both palms are facing upward. Thumbs are either side of the hoop. We are now back to the beginning. Hand two releases the hoop and hand one starts to rotate inward. I'd suggest trying to go into rotating circles from outside circles. When you are passing across the front into hand one, change the position of the hand so that it takes palm up. To come out of rotating circles, at the front pass, take the hoop with hand one, palm facing downward, back into outside circles.